The machine was used where a clerk was present to collect the money, which makes it ideal for home use. Note: there is no bottle mechanism or coin mechanism to get in the way of any use. It enjoys an all-metal construction with embossing on all sides and under the lid, as the original. It is also the same size as the original. Just like the original, there are wheels for easy moving. Don't miss the bottle opener detail on the outside, either. Vendo Corporation later purchased this machine from Westinghouse and fitted it with coin-operated top so bottle Cokes could be vended from it. This original machine was made entirely for Coca-Cola, no other brands were used. 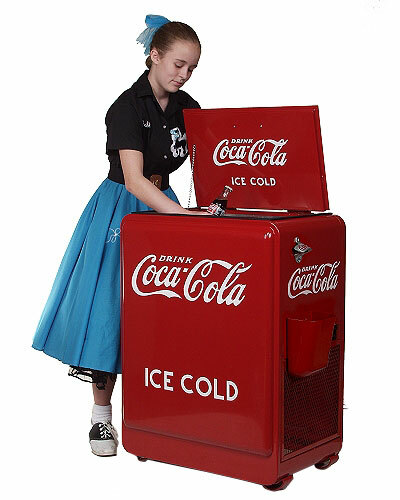 One of the attractions of this machine is its' beautiful and plentiful embossing, it has the Coca-Cola logo on all four sides as well as under the lid so it could be read when the top was opened. Additionally, it has “ICE COLD” embossed on the front and back. 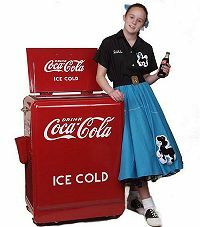 Many had “five cents” painted between the Coca-Cola and ICE COLD embossing on the front and rear. As with all our products, we kept this machine as original as possible, for example, it’s made in metal, the rubber seals under the lid are screwed, the cap catcher and bottle opener are exactly like the original and we even included wheels on the bottom like the original for easy movement. Its brilliant red color and contrasting white embossing make it a beautiful addition to the home, recreation room, patio or office. Unlike Vendo, we kept it the way Westinghouse designed it, you open the lid and you have a deep box to place cans, bottles, or anything else you want to keep cool. This machine will hold 80 cans of soda. The refrigeration model provides even more room for something else on top. *FREE SHIPPING WITHIN THE CONTINENTAL US. BEYOND POINT OR RURAL DESTINATION CHARGE MIGHT APPLY TO CERTAIN ADDRESSES. **AT THIS TIME, DUE TO LICENSING AGREEMENTS, WE CANNOT SHIP THIS ITEM TO CANADA BUT WE CAN HELP YOU FIND THE NEAREST BORDER LOCATION SUCH AS A UPS STORE OR MAIL BOXES ETC FOR LOCAL PICKUP.